Are the Viet Cong Still in Those Tunnels? The tunnels of Cu Chi are an immense network of connecting underground tunnels located in the Cu Chi district of Ho Chi Minh City (Saigon), Vietnam, and are part of a much larger network of tunnels that underlie much of the country. The Cu Chi tunnels were the location of several military campaigns during the Vietnam War, and were the Viet Cong’s base of operations for the Tet Offensive in 1968. The tunnels are now a popular tourist attraction. My son and seven of his friends are currently on a post-graduation trip to Southeast Asia. 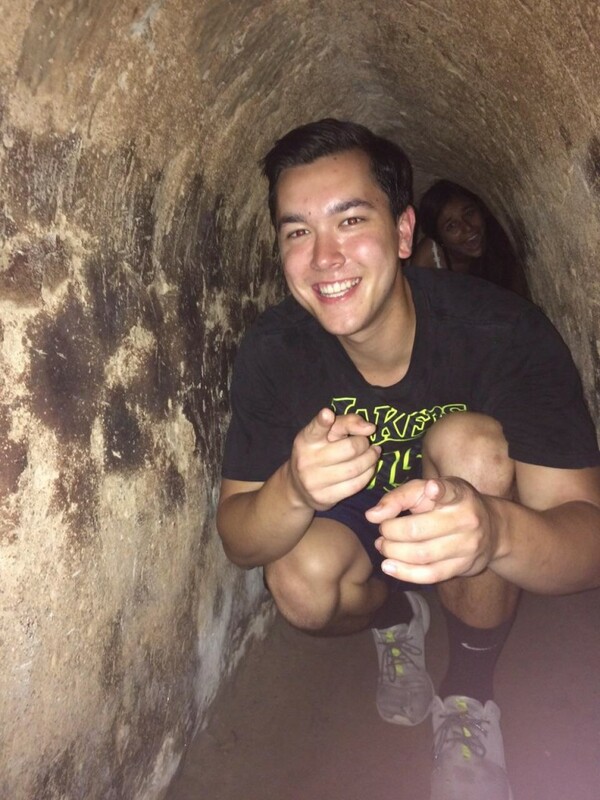 Here’s a picture of him in the tunnels. There were Japanese soldiers hiding out on Pacific islands for decades after World War II. They never heard the war was over. Is there any chance there are still Viet Cong in those tunnels? I think I see one over his shoulder . . . The comparison is apples and oranges. Charlie was on (or “in” if you prefer) his own turf. He (or she) could literally walk out and walk home – assuming home hadn’t wasn’t either a crater or a pile of ashes. This was not the case for the Japanese soldier – unless, of course, he could walk on water! Uncle Sam still hasn’t learned from the American Revolution. One cannot invade someone else’s country dressed differently and win a war where those opposed to the presence of foreign troops can blend into the local populace or scenery. Ignoring George Santayana’s words of caution (“Those who cannot remember the past are condemned to repeat it.”), the United States made the same mistake in Nam, Iraq, and Afghanistan that the British made in trying to suppress rebellion on the American colonies. Back in the late 18th century, just like their American counterparts in the late 20th and early 21st centuries, the British soldiers were better trained and equipped than the colonists. Yet, then as now, the locals prevailed. By the way, ask Junior how he thinks he would have fared as a Tunnel Rat sniffing out Charlie half a century ago.